Asda has opened its first stand-alone Click & Collect pick-up point which allows customers to order products online and have it delivered to the Asda unit at Greenpark. “Shoppers are on the move more than ever before – shopping from their mobiles, laptops, and tablets as well as in traditional stores. Our new Click & Collect pick up point means we’re bringing shopping to customers, rather than waiting in for a home delivery,” said Kieran Shanahan, Asda home shopping director. The unit is the latest move by Asda to make shopping more convenient for customers. “Stores without walls are the future for retail – and we’re getting to the future faster,” Shanahan said. The unit at Greenpark includes a WHSmith store where shoppers can avail of a range of magazines, stationery, confectionery, an ATM, Costa Coffee and e-top up. 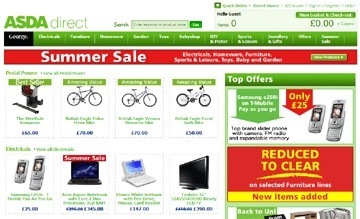 Asda are using the Greenpark unit to leapfrog into the commuter market for online shopping. The UK retailer are considering opening Click & Collect hubs in train stations. “Green Park is just one model, if we can have options to collect at petrol station stores, supermarkets and non-Asda hubs such as at park-and-ride hubs and train stations we can tap into commuters travelling to and from work,” Shanahan added. Posted on December 17, 2012, in Other. Bookmark the permalink. Leave a comment.